Greeley CO | ProMinent Fluid Controls, Inc. 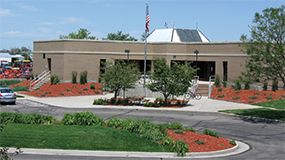 Switching from conventional batch mixing to in-line polymer preparation and feed has helped reduce annual polymer expenditures at the Greeley, CO., WWTP by approximately $12,000 per year. 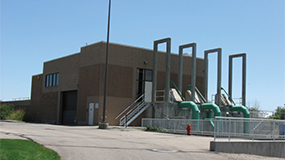 Optimizing polymer preparation and feed through an enhanced mixing regime has significantly improved the biosolids management program at the City of Greeley, Colorado’s Water Pollution Control Facility. Switching from conventional batch mixing to an in-line polymer preparation and feed system has also helped to reduce annual polymer expenditures by approximately $12,000. 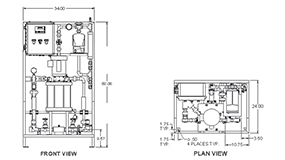 Processes for the 14.7 MGD advanced secondary wastewater treatment plant include primary clarification; activated sludge with fine bubble diffused aeration and nitrification and denitrification capabilities; secondary clarification; anaerobic digesters with floating covers; thickening and dewatering centrifuges and full SCADA monitoring and control of treatment processes and equipment, and an ultraviolet disinfection system. A portion of the sludge that settles out in the activated sludge process is returned to the aeration basins. 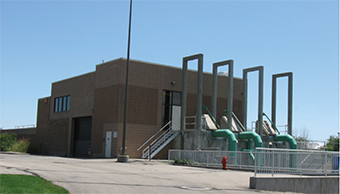 The remaining waste activated sludge is sent to a thickening centrifuge where it is thickened to approximately 6 percent total solids and then pumped to the primary digesters for further processing into biosolids. In the primary digesters, microorganisms consume about 60 percent of the sludge and also produce methane gas, which is used to heat the digesters to 98 degrees F and produce heat for the facility’s buildings. Primary digester solids are sent to two 500,000-gallon holding tanks until processed through a dewatering centrifuge. Biosolids average 2 percent total dry solids prior to dewatering operations. The plant dewaters approximately 60,000 to 70,000 gallons of sludge per day, four days a week, through a high-speed (nearly 6,000 rpm) centrifuge and then stores it in a large hopper until transported to agricultural sites for beneficial use. Since its program began in 1995, the plant’s biosolids operation had been achieving approximately 20 percent dry solids from the centrifuge. But two years ago problems began. In 2010, the plant’s dry solids recovery suddenly became very poor and polymer usage went sky-high. At one point the plant was using as much as 80 pounds of polymer per dry ton and was still struggling to make 14 to 17 percent dry solids. Plant personnel investigated all processes related to the dewatering and solids operation, including the polymer preparation unit. The plant had been using a conventional polymer makedown system comprised of two 500+ gallon tanks that would transfer in liquid coagulant polymer and water simultaneously. Once the required levels in the tanks were achieved, operators would then initiate mixing using a large high-speed mixer. Using the plant’s in-house-made batch system, one batch was made at a time and aged for half an hour before being fed into the process with a progressive cavity pump. The plant had been using that system successfully with no problems up until 2010. 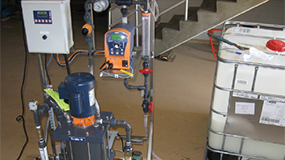 Polymer preparation and feed is a critical component in the biosolids handling process. Unless polymer preparation is completed properly, excessive polymer will be needed to provide adequate liquid/solid separation. Optimizing polymer feed can bring optimized results to dewatering performance. However, the lack of low shear mixing following poorly-designed initial polymer wetting can allow polymer molecule chains to fracture, resulting in ineffective flocculation. In polymer preparation, the first moment of initial wetting of polymer with water is most critical because of the high tendency to form large aggregates of polymers (“fisheyes”). Employing very high shear for a very short time period is required to prevent fisheye formation at this stage. This was determined to be the likely reason for the poor dewatering performance at the Greeley facility. The original freestanding polymer batch mix tank equipped with impellers induced high shear that was fracturing the extending polymer chains, thereby resulting in inadequate flocculation and requiring excessive polymer use to dewater sludge. To find a way to alleviate the problem, Greeley plant management decided to conduct performance trials for two different polymer blending designs and compare the results to the plant’s original makedown system. One of the units trialed was a ProMinent ProMix M system. The unit arrived at the plant fully assembled and all that was needed to put it in service was a 10-AWG extension cord, and a garden hose was used as a water source during the trial period. Once sufficient flow was determined based on the polymer percent makedown, the plant began dewatering sludge using the polymer prepared by the ProMinent unit. Based on the results of the performance trials, the city elected to install the ProMix M system, due to the drier cake produced and less polymer consumed during the threeweek period. The unit was permanently mounted with hard piping in May 2012. 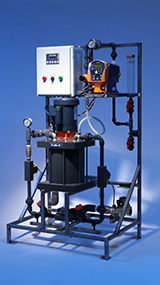 The ProMix M unit provides a multi-zone mixing chamber that delivers a tapered energy profile for proper polymer activation. This engineered profile effectively hydrates and mixes the polymer to a homogenous and fully activated solution, providing gentle agitation in the mixing tank to allow for the full extension of polymer chain molecules. The new system provides LCD display (including primary and secondary flow display) with touchpad control, remote start/stop and programmable auto-flush, and the unit maintains desired concentration based on primary and secondary dilution water flow. The plant is now back down to using 30 - 35 pounds of polymer per ton of sludge, and cake solids are also up and now consistently average around 19 percent. This calculates to approximately $12,000 in annual savings in polymer use alone. Plus, with the final sludge water content now much lower, this has greatly reduced the costs to transport biosolids to the field, where they are applied to local dry-land wheat farms by a private firm. Because better activation results in less polymer needed to do an equal job, the Pro- Mix unit has paid for itself by making full use of the chemical being fed.